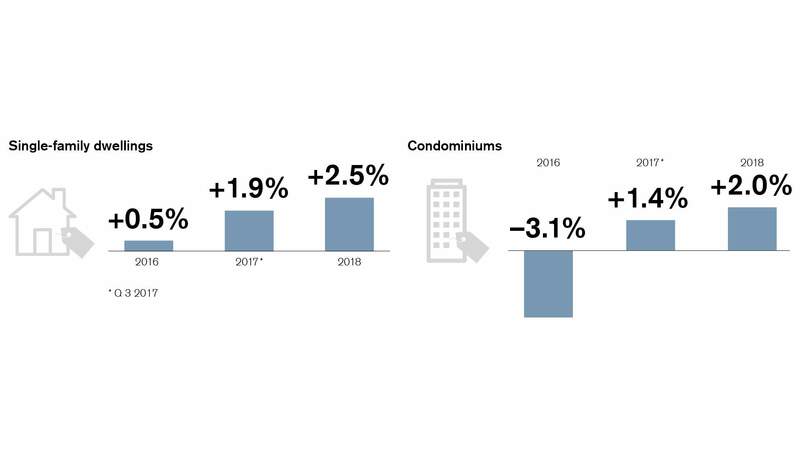 Real estate prices in Switzerland are rising again, as illustrated by the Credit Suisse study on the real estate market in 2018. For many people, home ownership is no longer affordable. But buying a home doesn't cost the same everywhere, and prices vary sharply from region to region. After 14 years of price growth, prices of owner-occupied homes fell in the winter of late 2016/early 2017. But the decline proved short-lived, and real estate prices in Switzerland are now rising again significantly. The strong economic upturn is driving demand for residential property, especially as mortgage interest costs remain at very low levels despite a slightly upward trend. Even around Lake Geneva, where the recent price correction had the greatest impact, prices are rising again in most cases. Prices are still declining at a modest rate in the cantons of Valais, Schwyz, and Glarus, the two Appenzells, and parts of the cantons of Ticino and Graubünden. Buying a house or apartment is no longer possible for many households. The high levels of equity and income required limit opportunities for buying a home. In 2017 an average-income household would have needed to spend an estimated 38.4 percent of its income on buying an average new-build property. Although the burden has fallen a bit in the last two years, it remains well above the critical threshold of 33 percent. The demand for residential property therefore continues to be dampened. Prices vary sharply from region to region. Residential property around lakes Zurich, Geneva, and Zug is particularly expensive and unaffordable for a large proportion of households. Costs have continued to increase – especially in the Canton of Zurich. By contrast, real estate in rural areas is considerably cheaper. A portion of homebuyers are therefore likely to escape to regions with more affordable prices and a correspondingly lower imputed affordability calculation. The interactive information graphic shows the average cost of buying a home in each region, and how much real estate prices have changed since 2012. By clicking on the region, it is possible to calculate whether residential property in the chosen region is affordable for you or not. By entering your gross monthly income and how much equity you have, you can calculate affordability in your own individual situation. 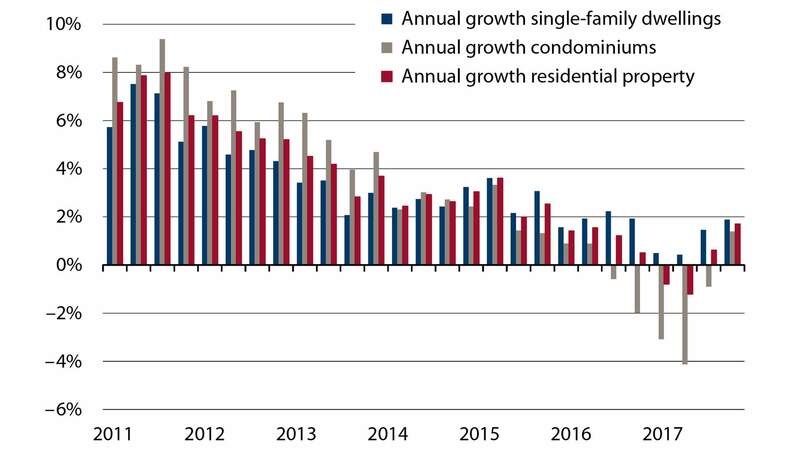 Credit Suisse economists anticipate a relative shortage of residential property due to demand-supporting economic growth and further falls in construction activity. This is likely to be reflected in persistently low vacancies in 2018. A slight decline in vacancies is actually possible. Against this backdrop, a positive price trend is expected again for 2018. The price correction is likely to be over at the upper end of the market too. However, the real estate market is unlikely to become overheated again given the high price level and regulatory constraints.